Adjustments: Many of the following completion dates come from Scott Kozel's website. In Dec 1966 (Kozel), I-264 opened from Des Moines Ave to VA 141 at the Downtown Tunnel approach. In Dec 1967 (Kozel), I-264 opened from US 460/VA 166-168 Brambleton Ave east to I-64/VA 44. In July 1972 (Kozel), I-264 opened from Brambleton Ave to the Berkley Bridge. The parallel Downtown Tunnel opened in March 1987 (Kozel). 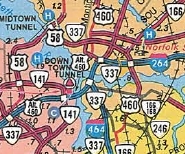 The original tunnel was opened to two-way traffic as part of US 460 ALT in 1952. In July 1991 (Kozel), the Berkley Bridge was expanded and connections made to new I-464 and downtown Norfolk, to complete I-264. In Aug 1997 (CTB), VA 44 was transferred to the Interstate System pending AASHTO approval. 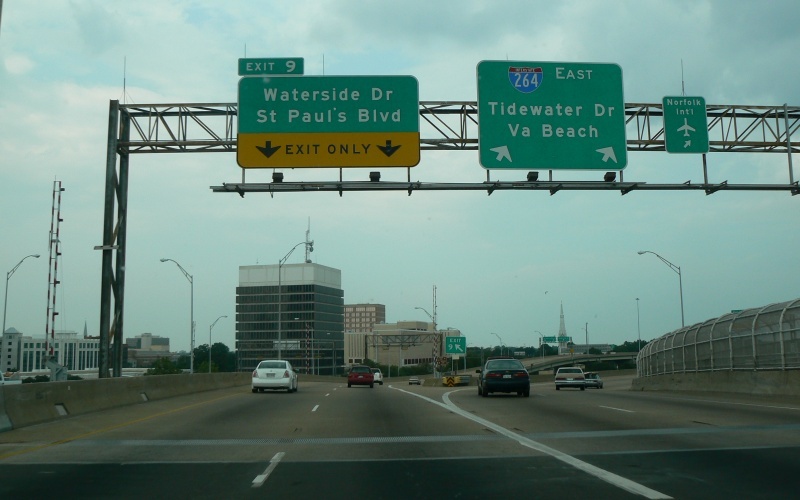 In July 1999 (Kozel), I-264 was added to VA 44 out to Parks Ave near the Oceanfront. VA 44 was deposted by 2001. Improvements: I-264 opened as 6-lanes everywhere except Bowers Hill to VA 239; Downtown Tunnel to Brambleton Ave which are 4-lane segments. VA 44 was 8-lanes from I-64/264 to First Colonial Rd and 6 lanes to Parks Ave when I-264 took over that highway. In 2000 (Kozel), I-264 was widened to 8-lanes from US 460/VA 166-168 east to I-64. The innermost lane each way from Brambleton to about Rosemont Rd is HOV-2. The shoulder lane is open in each direction during its respective rush hour providing a 5th through lane from VA 190 to Rosemont Rd. Removed Exit: Exit 6, Des Moines Ave was removed to make way for constructing the VA 164 extension from US 58 south to I-264. Posted: Fully posted; A fair number state-named shields remain in Portsmouth, though I believe none are onI-264 itself. VA 239, US 460 ALT, VA 337 ALT, VA 337, VA 405, VA 403, VA 190, and VA 225 are not posted from I-264. 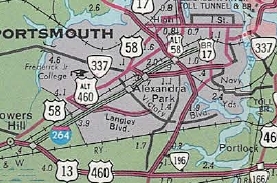 Neither were the former VA 4xx routes which intersected I-264 (410, 411, 414). 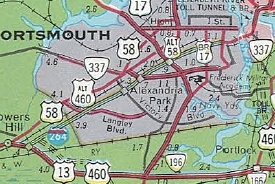 VA 337 (which follows I-264 across the Berkley Bridge) was posted at the eastbound Tidewater Dr exit at one point in the early 1990s, but is not posted there now. Comments: Except for its westernmost mileage, I-264 is very busy and congested. 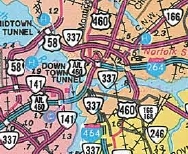 The Berkley Bridge/Downtown Tunnel complex is one of the worst bottlenecks in the Hampton Roads area. Eastbound I-264 through traffic must merge right at least one lane while on the Berkley Bridge, lest they exit off onto St. Paul's Blvd and into downtown Norfolk. I-264 blows off VA 165. Seems like 21st and 22nd Sts in Virginia Beach should've been designated as part of VA 44 way back when and VA 264 now for some continuity, but at US 60 it is posted TO I-264 at 21st St and I guess officials think that is good enough. Check out Froggie's I-264 photo gallery.